^ Shirk, Stephanie. "30 Indie-Folk Artists You Need to Hear ASAP". Odyssey. Odyssey Media Group. Archived from the original on July 5, 2017. Retrieved July 5, 2017. ^ "Music of the Avetts: Scott, Seth - and Jim". charlotteobserver. Retrieved July 22, 2018. ^ "Avett Brothers - A Carolina Jubilee". No Depression. June 30, 2003. Retrieved July 22, 2018. ^ "Avett Brothers Continue Their Fast Pace – October 2004". Countrystandardtime.com. Retrieved February 18, 2017. ^ "The 18 Best Concept Albums of the 21st Century (So Far)". PasteMagazine.com. Retrieved February 18, 2017. ^ a b "The Avett Brothers". PasteMagazine.com. Retrieved February 18, 2017. ^ "Catching Up With... The Avett Brothers". PasteMagazine.com. Retrieved February 18, 2017. ^ "Avett Brothers Announce New LP 'True Sadness'". RollingStone.com. Retrieved August 29, 2016. ^ "The Avett Brothers' 'True Sadness': EW Review". Ew.com. Retrieved August 29, 2016. ^ "The Avett Brothers: True Sadness Album Review". Pitchfork.com. Retrieved August 29, 2016. ^ "Here Is the Complete List of Nominees for the 2017 Grammys". Billboard.com. Retrieved December 6, 2016. ^ Knox, Michael. "Avett Brothers Celebrate Community at Hall of Fame Induction". Independent Tribune. Retrieved December 12, 2016. ^ "SXSW 2017 Film Festival: 125 Features from Terrence Malick, Edgar Wright, Judd Apatow, and More". Vulture.com. February 1, 2017. Retrieved February 1, 2017. 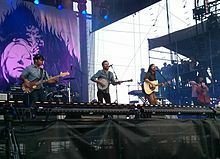 ^ a b "'May It Last' Brings The Avett Brothers From North Carolina To HBO". NPR.org. Retrieved February 3, 2018. ^ a b "Paul Defiglia". www.theavettbrothers.com. Retrieved August 18, 2017. ^ a b "The Avett Brothers | Community Center Theater | 3/30/18". Grateful Web. Retrieved August 27, 2018. ^ a b "Tania Elizabeth on Instagram: "Maternity leave is a wonderful thing..." Instagram. Retrieved August 27, 2018. ^ "The Avett Brothers are ready to celebrate the highs and lows of 2017 – and look ahead". newsobserver. Retrieved December 23, 2017. ^ a b "The Avett Brothers Debut Heartfelt Ballad 'Roses and Sacrifice' on 'Late Night': Watch". Billboard. Retrieved October 25, 2018. ^ "The Avett Brothers Release New Single 'Roses & Sacrifice'". JamBase. November 16, 2018. Retrieved November 16, 2018. ^ Gage, Jeff; Gage, Jeff (February 1, 2019). "Hear the Avett Brothers' Wintry New Song 'Neapolitan Sky'". Rolling Stone. Retrieved February 2, 2019. ^ "Avett Brothers' hurricane relief concert will help the place they once called home". newsobserver. Retrieved October 31, 2018. ^ "As Avett Brothers finish new album, they return to Tallahassee with deep questions". Tallahassee Democrat. Retrieved March 8, 2019. ^ "About". JacobGEdwards.com. Retrieved January 3, 2017. ^ a b c "The Avett Brothers". IMDb.com. Retrieved February 1, 2017. ^ "The Music of 'Inside Llewyn Davis' Is Celebrated In New Showtime Documentary". Cinemablend.com. December 13, 2013. Retrieved February 1, 2017. ^ "See Jack White, Elton John Recreate Early American Recording Sessions". Rolling Stone. Retrieved February 27, 2018. ^ a b "The Avett Brothers to Appear on _The Tonight Show_, _SiriusXM_, _Today Show_". www.jambands.com. Retrieved February 3, 2018. ^ "You Made It Weird with Pete Holmes : The Avett Brothers". youmadeitweird.nerdistind.libsynpro.com. Retrieved July 22, 2018. This page was last edited on 12 April 2019, at 22:03 (UTC).